Is Your Dog Well Behaved? Good dog behavior is based on two pillars: exercise and structure. Dogs with too much pent up energy are rarely well behaved, and an up- and- down routine can confuse them. Regular walks help establish a solid routine while exercising your dog in the process. Hustlin Hounds has professional dog walkers who can establish a regular exercise schedule for your dog around your busy schedule. A normal exercise schedule bolstered by professional dog walkers will help you train your dog. We offer the best dog walking Fort Collins has to offer. As professional dog handlers, we give your dog all the attention and socialization he needs. Hustlin Hounds also offers pet sitting so even when you’re on vacation, your dog will receive top notch care. Normalized schedules can be difficult to maintain, especially if you travel, that is why we offer such comprehensive dog pet sitting services. We want you and your dog to be happy and healthy with the help of our expertise. 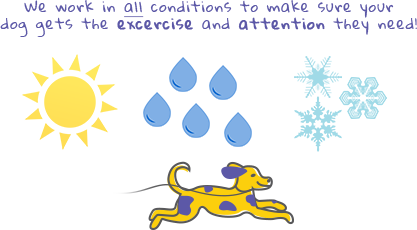 A regular cadence of exercise is the first step to a well-trained, happy dog. Call us to set your dog up with the best dog walkers in Fort Collins and keep your dog happy and exercising.